Air Malta includes baggage allowance in the flight price and there is also a 32kg sports luggage allowance, Air Malta flies from London, Heathrow or Gatwick, Manchester, Glasgow*, Birmingham*, Bristol*, Cardiff*, Norwich* and Exeter* and other destinations around Europe. Easy Jet - From Belfast, Gatwick, Manchester, Newcastle. Have a read here for more information on Malta International Airport. It also lists full destinations around Europe as well as useful info about Malta and Gozo. Gozo Channel Ferry runs throughout the night, so don't let booking late night flights put you off coming to Gozo. The ferry journey only takes 20 minutes and a single foot passenger ticket payable ONLY from (Mgarr) Gozo to (Cirkewwa) Malta costs €4.65 per person so there is no reason to not visit Gozo! Malta Public Transport are currently running the bus service, the X1 bus service from right in front of Luqa, Malta Airport straight to Cirkewwa, Malta ferry terminal. The bus is a great, cheap way to see some of the sights on Malta so your holiday really starts from the minute you land at the airport. 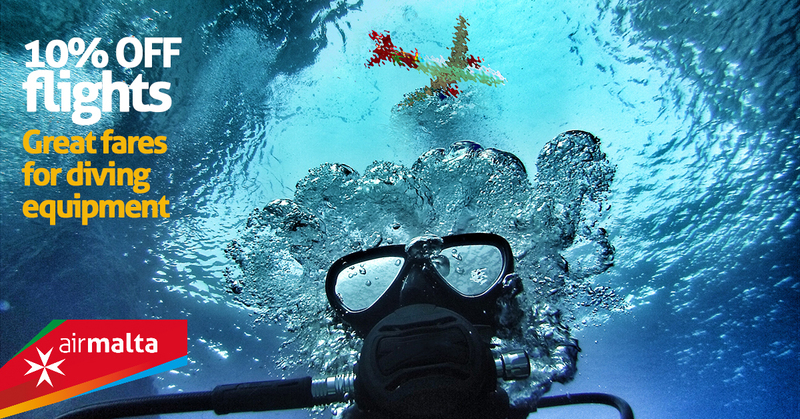 Click on the banner below to go to the Air Malta diving offer. visitgozo for more information about what events or Feasts are happening throughout the year. For more information about the Maltese Islands, diving around Malta and Gozo have a look at the following websites to get you really excited about a trip to Gozo.